Living frugally helps me identify what I view as worth spending money on. Most people just simply do not make enough money to spend money on everything they could possibly want. Even multi-millionaires can't buy everything they see - there are just too many products with too high of costs to be able to do so. Living frugally helps you decide where you can, without great pain, cut back. As you assign money to different categories in your budget, you can see what categories you might be able to tighten up or erase altogether. For us, eating out is something that doesn't bring us a tremendous amount of satisfaction - I like to cook, Bart doesn't mind doing the dishes, and the cost of eating out is not worth the experience on a regular basis. Other things, that some people might be absolutely happy to spend little or no money on, are more of a priority for me. I am not willing to sleep on a mattress on the floor or keep my clothing in a laundry basket. Having decent looking, functional furniture is important to me, enough so that I'm willing to prioritize my money in that category. Some of you might pick a weekly dinner out a thousand times before a piece of furniture. Some of you might be willing to keep both of those categories incredibly low in order to spend money in a third category of your choice. Sometimes, of course, there is some trial and error involved with identifying what you really value. A few years ago, Bart really wanted a new TV. There was a pretty good discount associated with his job for an LCD flat screen television and suddenly he really wanted to purchase it. Because we could afford it, we went ahead and bought it, replacing the basic TV Bart had received for free from his aunt and uncle when they no longer needed it. We gave the old TV to some friends of ours and ended up watching many movies on it at their house. After a few viewings, Bart told me, "Our new TV really doesn't make any difference to me. I don't enjoy a movie any more on our TV than I do on our old TV." We both realized that, for us, the TV had not been something worth the money. Living frugally - committing to watching where my money goes - helps me spend my money on things that really bring me satisfaction and also helps me avoid spending on things that mean little or nothing to me. You know, I think living frugally as a choice has so many more perks than living frugally because you just have to. We are somewhere in the middle (as in our saving accounts have money in them... but our monthly income is one part time job), and I keep trying to get myself in the mentality that I'm living frugally because I want to, because it's satisfying. But much too much of the time it feels like I'm cornered into it. Yuck. And I feel guilty for anything I spend beyond the bills. I'm working on it. I know it's good for me and I know it's worth it. But sometimes I just want to buy a new _____ without feeling like I've blown my budget. Even if I didn't budget for it. Sigh. On a happier note, I really appreciate your posts reminding me why living frugally is satisfying. Everything you've listed so far I have also found to be true. When I look back at all the money I have wasted over the years...ugghhhh. I wish that it hadn't taken me this long to figure out that more than half of the stuff that I thought I really wanted, ....really wasn't that important! Better late than never- right?! I think it's really interesting to see what other people value and spend money on. It really shows how different people are. My sister-in-law mentioned to me recently something to the effect of, "Everyone thinks they are frugal because everyone can think of something they want that they are holding out on buying." 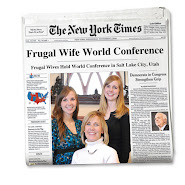 Our family motto is "Live frugally and travel." It works for us. Other people may say, "Live frugally and eat fine cheese." That kind of boggles my mind, but maybe our traveling boggles their minds. I love making a yummy dinner and then talking about how much it would cost at a restaurant.